Looking for a recipe to use leftover ham? 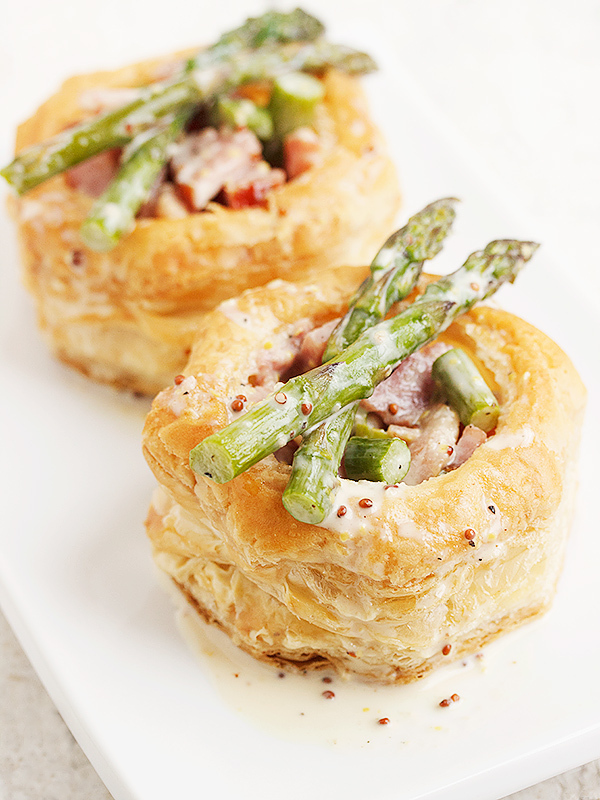 Try this quick and easy Ham and Asparagus Vol au Vent, with ham and asparagus in a cream and grainy mustard sauce. I hope everyone had a wonderful Easter! I thought I’d share a quick and easy dish to use up some left-over ham, in case you’re dealing with that situation. 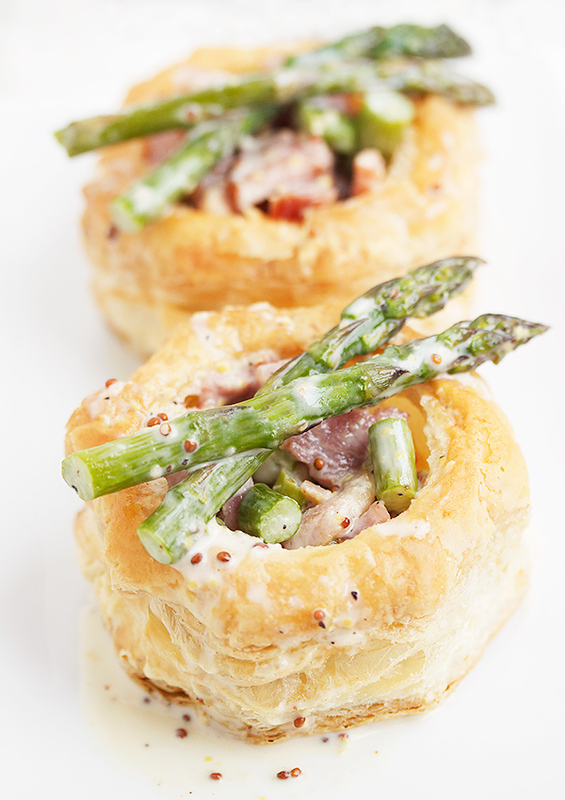 Vol au Vent shells are a bit retro I guess, but they’re still a delicious and a simple way to dress up dinner. I love that they can be cooked from frozen, because I’m terrible at remembering to take frozen things out ahead of time. 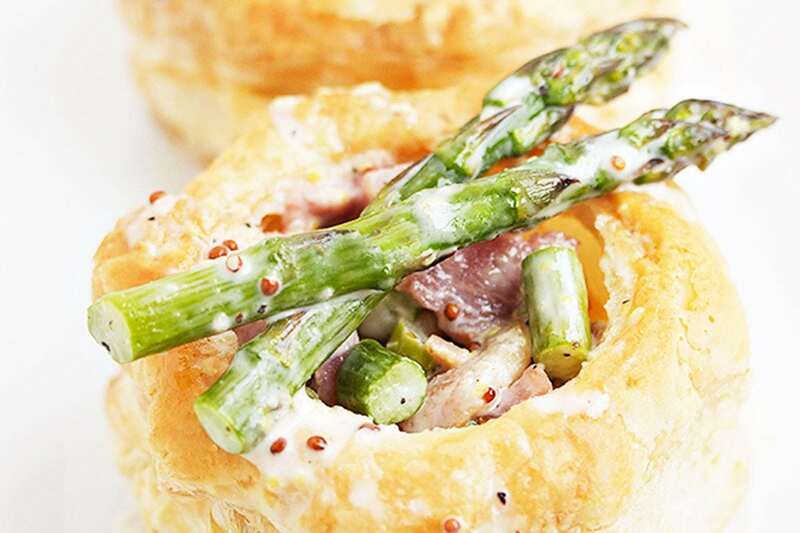 While they bake in the oven, all you need to do is a quick saute of some fresh asparagus and diced cooked ham. To finish, add some heavy cream and grainy mustard and let the sauce reduce. And voila! Dinner in a flash and a lot of that leftover ham dealt with. If you’d rather use a lighter cream you certainly can. Simple mix a little cornstarch in with it to thicken it up a bit. I’ve mentioned before that I like Maille’s A L’ancienne Grainy Mustard which is fairly mild-ish. If you’re grainy mustard is a bit more potent, you may wish to use less. Probably best to add a little, then taste and add more as necessary. A perfect use for left-over cooked ham, this simple but elegant meal comes together in less than 30 minutes! Bake vol au vent shells according to package instructions. While the shells are baking, heat olive oil over medium-high heat. Cut asparagus tips off, about 3-inches from the tip. Cut the remaining stalk (less the woody end), into pieces about 1/2-inch wide. Add all the asparagus to the pan and saute until tender crisp. Add cooked hame and saute for another minute or so. Add cream and mustard (add 1/2 Tbsp. mustard to start and then more, to taste) and reduce heat to medium. Allow cream to simmer until reduced by half. To serve, spoon filling into baked shells. Spoon sauce over top and top with a couple of the asparagus tips. Jennifer… I had to use phyllo dough sheets to make cups — it wasn’t a success but not a full failure either. I had never used them before and realized you cannot stack up 18 sheets together and expect them to perform!! 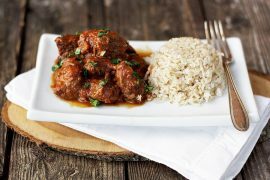 This is a wonderful recipe.. I added a clove of garlic and some green onion and did a light hand with the mustard. Will plan to make this again and put my hand on another box of phyllo with anticipated better results! Live and learn :) Can you find sheets of puff pastry? They would be easier to work with I think and they can be cut and shaped so easily. I do have left over ham! I will make this! 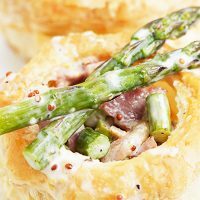 Jennifer: We live in a small rural community and I already know for sure that we are not able to purchase vol au vent shells at our grocery. Any good ideas for a substitution? That’s too bad, CJ (they’re handy and delicious!). I think a nice buttermilk biscuit would be a nice substitute. P.S. I might make more of the sauce if using biscuits. I absolutely love the look and sound of this fancy little dish! I’m also a huge sucker for anything involving mustard, so i’m going to have to make these! Thanks Phi. 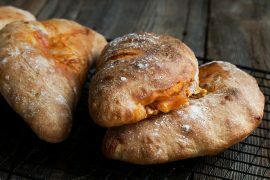 These were delicious and so easy! 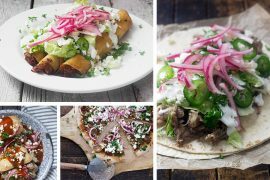 What a wonderful way to turn leftovers into something new. I love the mustard sauce! Thanks Laura. I was longing for something a little different to do with my ham and this was perfect!